YES, friends. YES. 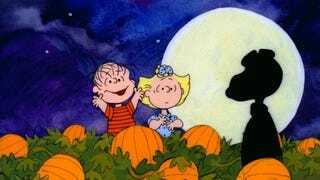 It's that time of the year, when Snoopy rises out of the pumpkin patch and deceives Linus into thinking he's a living incarnation of everything wonderful about Autumn. What? Halloween? No, don't be ridiculous. I'm talking about DISCOUNT CHOCOLATE DAY. Anyway, this has become something of A Thing for me over the years, as various holidays have led to various types of disappointment and/or depression, so I celebrate by waiting until the morning after the holiday and then descending like a coherent, vaguely man-shaped cloud of locusts with gluttonous intent upon whatever themed delicacies I can find. As it happens, Halloween was very pleasant this year, but, you know. Tradition. Go forth, my enormous pink brains on exercise bikes! Go forth and pillage the bounty of His Pulpy Grandiosity*!